The website leaves a pleasant impression: you can find the answers to virtually any question without contacting the support, most of the filler text is concentrated behind the links in the bottom section, so you don’t normally get there, price calculator is conspicuously located and easy to use, and the design itself is nice to look at. Prices range from low to average, depending on the kind of assignment, its academic level and the proximity of the deadline. For example, High School level costs less than in most cases, from $10 to $25 per page. Doctoral texts rise as high as $48 per page, which seems to be somewhat too low for such a level. All in all, the prices are nothing very much out of the ordinary. 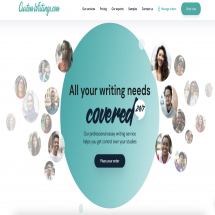 Additional services and business writing have their own price ranges. Chat operators are well-informed and quickly react to your queries. There is, however, certain vagueness as to its working schedule. The site says that it works from Monday to Saturday, but the operators themselves state that they work 24/7. Although there is a page marked as ‘Sample Papers’, there are no examples, which means it is impossible to judge the average quality. You can contact the writer via internal message system, but the support moderates the conversation.